I have to admit that I really don`t like tribute bands and avoid them at all costs. I`d rather see a band that write and perform their own material, no matter how awful they are. But when I read about Stairway To Heaven: Led Zeppelin Masters, it really intrigued me. Led Zeppelin are a band whose material was ground-breaking and has certainly stood the test of time. Australia’s celebrated live concert event Stairway To Heaven: Led Zeppelin Masters has returned to the UK for ten-dates as part of their European tour, marking fifty years since the release of Led Zeppelin’s self-titled debut album and its follow-up, Led Zeppelin II. The evening is essentially the Zep Boys, a Led Zep covers band, backed by a thirty-five-piece orchestra they name The Black Dog Orchestra. The orchestra, we learn are ninety per cent Brummies’ so I can assume they have seconded a fair few from our wonderful CBSO. Tonight, was the penultimate show on this UK leg and Birmingham`s Symphony Hall was about the perfect venue to hold this showcase. 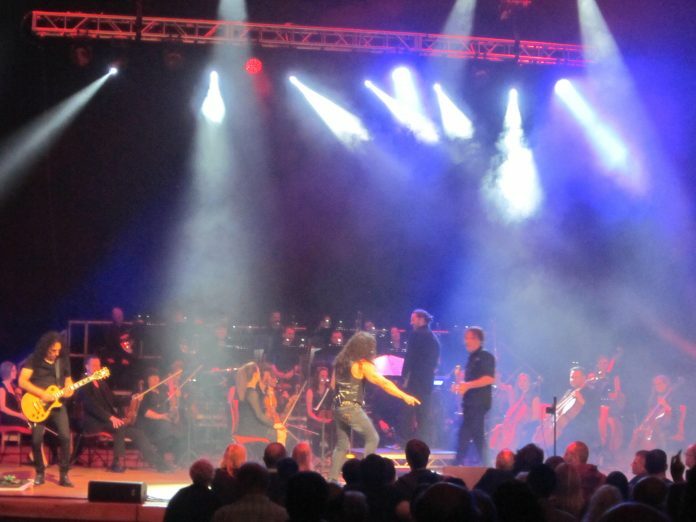 The night begins with the orchestra running through snippets of Zep numbers to give a flavour of what`s to come. The Zep boys hit the stage and head straight into `Good Times Bad Times` and `Nobody`s Fault But Mine` and i`m taken aback as to what a dynamic voice singer Vince Contarino has. On the latter song he plays harmonica and catches us all out when he stops and starts the song near the end. I was mesmerised with the performance of the next three tracks with `Over the Hills And Far Away`, `Ramble On` which started with Vince playing an acoustic guitar and `All My Love` The orchestral arrangements actually brought out the wonderful rich textures and absolute beauty of these songs. There`s chance to rock out with `The Song Remains the Same` before guitarist Tzan Niko picks up a double necked guitar and highlights his abilities on `Rain Song`, The hypnotic nature of `Dazed And Confused` is brought the fore before the audience are on their feet singing and dancing along to `Rock And Roll` as the first half of the show comes to an end. I have to say any cynicism on my part was blown away after the first couple of songs this evening. The Zep boys are superb musicians and Vince Contarino has a blistering vocal range and enthralling stage presence. The addition of an orchestra brings this night a different dimension. The arrangements enhanced the depth of the songs and were delightfully executed. I have to admit I was stunned by this evenings presentation and have already dug out and dusted down my Led Zep collection to try and relive this fabulous evening.